· Please be explicit , download right in our site the image of the type of benches sets of your interest. · Forward your order or request for a quote including the download and attached image the exact to the email address. · Please in your email include the specification you would like you bench sets to have. · Specifications include: Do you need umbrella holes? , With or without backrests? , what colours? · All should be forwarded to the email address above. Cape Medical Response- Fish hoek - 2 benches & table. Fetola- Plumstead- 2 benches & table. · All corners on wooden benches are round for safety purposes and neatness. · We use SABS approved Treated Pine wood thick. · We use SABS approved long Screws long enough to keep the bench strong and we use SABS approved Glue and Screws to join and strengthen all wooden products we build. · All wooden products get sanded down for perfection before they are painted, stained,varnish or any other types of paints. · We apply atleast 6 coats of paints, Varnish or Stain on for longer lasting. · 6 extra wooden supports for benches are installed under tops and seats, to keep the benches strong. 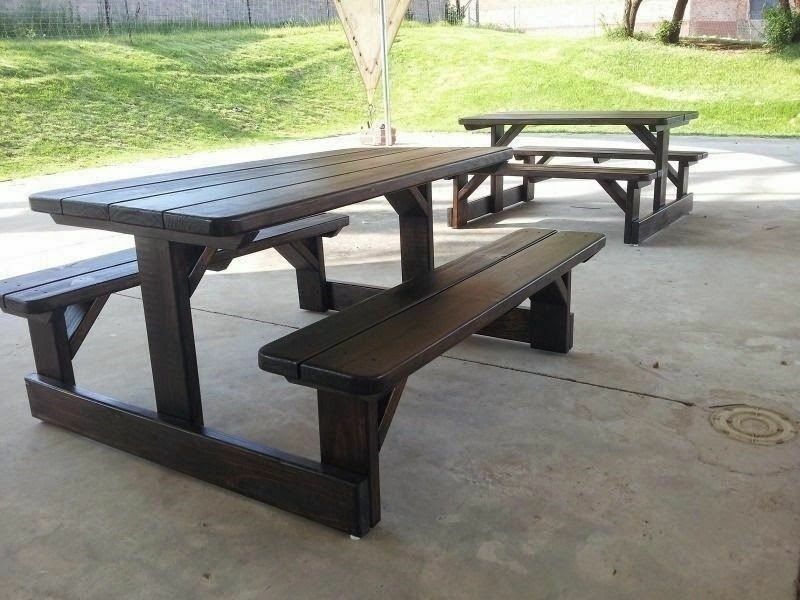 Although we supply restaurants, parks and schools these picnic benches can work wonders and enhance the look of your entertainment area. Beautifully crafted these pine picnic benches provide comfortable seating and maximizes small spaces. Perfect along paths in the garden, under large trees or children play areas. You can choose from the range of sizes 4,6,8,10 and so forth. Thanks to the beautiful western cape weather and late sunset these make a perfect accessory to outdoor dinners, pool side lunches or the braai over the weekends. The patio sets are sealed and treated against all elements of weather and finished to a smooth sheen. You can choose from variety of standard colours or create a two tone colour. Regardless of space available, patio furniture is a must for entertaining guests. Garden benches are perfect for the garden, balcony, under and tree or small patio. These attractive garden benches are build sturdy and can withstand harsh and unpredictable weather. The designs and styles remain the right of our Products company. Simple theme. Powered by Blogger.